Hi loves! Another pretty from Polish Alcoholic today, a Dutch indie brand created by Sabrina who's also a blogger herself. This time I am showing Polish Alcoholic I Want To Believe which is part of the X-Files collection and available right now! How about a confession to start with? I never watched a single episode of the X-Files.. I don't know, I'm not to keen on sci-fi nor horror so it never really appealed to me. Also, I was quite young when this show started (I was 5 when the first episode aired September 1993!). While I never seen any episode I do recognize the lettering Sabrina used on the labels as well as the names and vibe these polishes have. So let's take a look! Polish Alcoholic I Want To Believe is a layering polish. The base is clear and it is filled with a blue shimmer that almost seems to glow and shifts color from a greenish turquoise to a super electric blue. On my nails I only saw the electric blue. I choose to layer this over something dark but not a flat black - I went with the Chanel Taboo alternative namely Kiko 497 Pearly Indian Violet. There already is a blue sparkle present in that shade, and layering this one on top of it.. fireworks! I used 2 coats of I Want To Believe and it applies and spreads easy. The glitter is a bit gritty so a good topcoat is recommended. Before trying this combination it was actually layered over a purple creme but I experienced some severe bubbling.. luckily that wasn't the case in this experiment. The topcoat I used is Glisten & Glow HK Girl topcoat. To try and capture that intens blue sparkle I also made a fun video on Instagram which you can check here. So, what do you think of this combination? Yay or nay? Tell me in the comments! Polish Alcoholic is a hand-blended indie brand made in The Netherlands. Sabrina creates various polishes which are 3-free (and some are 5-free). You can buy Polish Alcoholic at the Etsy shop. You can connect with Polish Alcoholic on Twitter, Instagram, Pinterest, YouTube and Facebook. Oh, I need to buy that Kiko ! 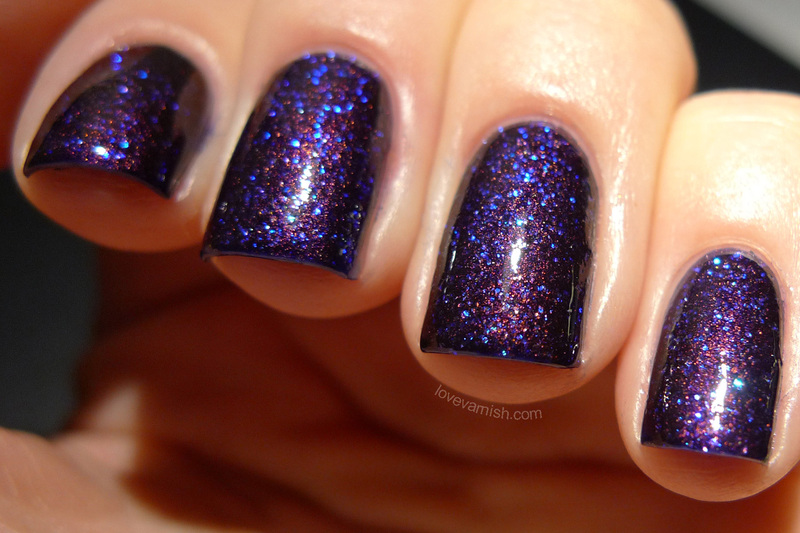 This is such a stunning nail polish! I want!! :D it's a rue beauty! I bet it looks amazing over a deep dark blue, too! Gorgeous! I especially love the copper shimmer of the Kiko below the blue glitters! Wow, this is insanely gorgeous!! Thanks Aglaya, I was quite happy with the outcome too ^^. Thank you so much! And boo :( where are you from? I'm from the U.S. :( I haven't been able to find any online shops that sell Kiko and ship to here either. Aww, shucks. And Kiko isn't sold here either (unfortunately ordering it online is kinda expensive because of the shipping cost) otherwise I would have been happy to help! Aww, thank you! I guess the search for Kiko (and purchased at reasonable prices) goes on for us. GAHHHHH!! This looks sooo amazing! I love love love it! Aaaah! I Want To Believe is gorgeous!! I was never allowed to watch it since I was little when it was on too. I can remember it being pretty freaky at times though! !